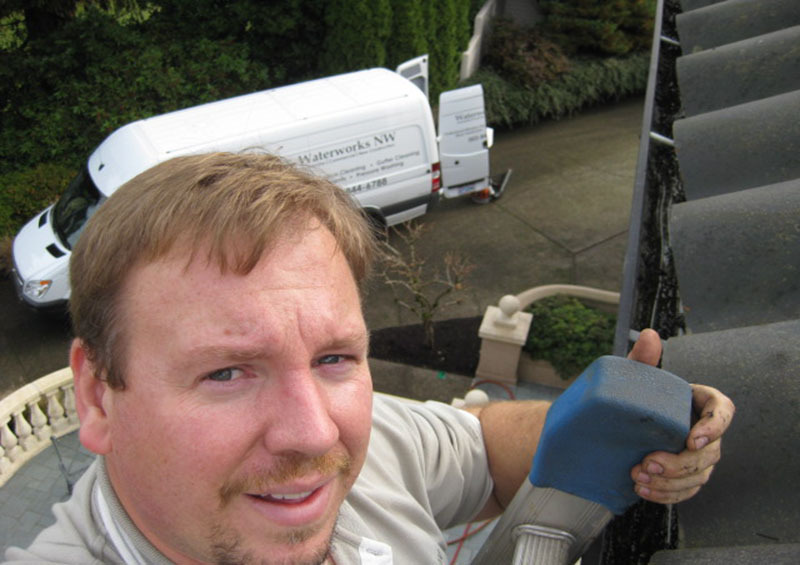 Gutter Cleaning – Waterworks NW specializes in residential gutter cleaning services in Portland, Oregon. Our gutter cleaning motto is pretty simple; leave the job site better than when you arrived. Show up on time, be professional, courteous and give an “Iron Clad” guarantee that you will be impressed with our service, or it’s free. We start by removing the debris inside the gutter by hand. We then flush the gutters and downspouts to make sure everything is working properly. We will make notes of any issues with the gutter drainage that might need to be fixed prior to the rainy season. Then we double check for any debris that may have been missed and haul away all debris. Lastly, we do a final inspection of the property and make sure nothing needs immediate attention before the worst of the weather catches our clients off guard. Gutter Cleaning Maintenance – The primary function of your gutter system is to remove water from your roof; away from your foundation. Gutters aren’t meant to hold large quantities of debris from trees, grit or grime from your roof. A secondary function of your gutter system is to prevent erosion of the ground around the roof line. A gallon of water weighs 8.33 pounds. A clogged downspout can prevent a hundred gallons of water from draining safely away from your foundation. Gutters that are full of water can also begin to seep water into the fascia board causing degradation and rot. Your roof continually sheds granules that are deposited in the gutter. Even if there aren’t trees on your property or near the gutter line, your gutters fill up with debris. This is one of the most common misconceptions of homeowners and gutter maintenance. We pull hundreds of pounds of sand (roofing granules) out of gutters every week. 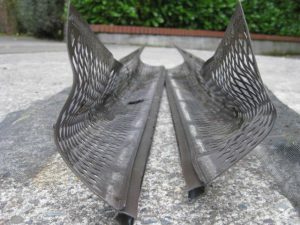 Gutter Guards – Why don’t you guys install gutter guards? The simple reason is, in most cases they don’t work as intended. We remove many gutter guard systems each season from residential homeowners who are fed up with them. It is one of those products that almost always over promises and under delivers. 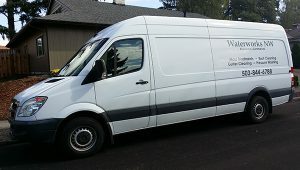 In our 25 years of experience, there isn’t a product out there that is worth installing. Gutter foam (pictured right) gets clogged with sand, pine needles and moss. Within a couple of years this product was removed by us, costing the homeowners a fortune during installation. There are many different types of foam with wild guarantees, and in our experience, it’s not a product that delivers on the promises made. Vinyl Gutter Guards are a popular product. Relatively cheap, easy to replace. But after just a few years in the sun, they deform (pictured below left). It becomes next to impossible to snap them back in place when the gutters need cleaned. One of the other issues with gutter guards is needles. If the gutter guard design is to keep out all debris, they will clog with pollen and silt on the roof, causing the water to sheet off during heavy rain. This will deposit the dirty water on the exterior of the gutter. Mold and algae quickly follow causing discoloration. 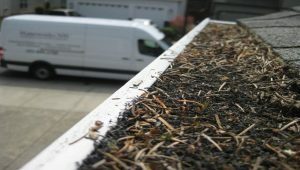 Enclosed Gutter Systems – While these seem like the perfect solution to the back breaking chore of gutter cleaning, year after year, they do have some downsides that should be considered. These types of gutter systems work by using surface tension. A small opening on the front edge of the gutter encourages water inside carrying it away from your home. These work great in theory. Our observation is they fill up with needles, debris and especially in the Pacific Northwest, grow mold. The mold breaks the surface tension bond. In our 25 years experience cleaning gutters there is no perfect solution to maintenance free gutter cleaning. Each system has its trade-offs, and to some, a benefit. The main issue with the systems listed above is they try to enclose the gutter and don’t permit a quick visual inspection, which can lead to neglect down the road.